1. Can you boil water? Yes? Yes. Good. So you can try different combinations of noodles, sauces, and toppings, but please do a little research before making a mess! A great (easy for dummies) resource that has a plethora of knowledge on all things food is www.recipes.com. Below you will find a collection of different things you could try, as well as two simple (and yummy) recipes for different types of pasta. Other stuff: cheese.. so much cheese, garlic, different herbs and seasonings. Beginners should start small. This is NOT a “go big or go home” situation, trust me! Tip: an easy way to make sure your noodles are ready to eat is to take a noodle and throw it against the wall, I know it may sound crazy, but it works. A noodle that is finished will stick to the wall. The great thing about pasta is that you can buy it in bulk, it reheats well, and stores easily. In closing I want to say that I in noooooo (NO) way consider myself an excellent cook, I was chosen because my cooking skill besides probably being quantified as a negative, gives me the ability to identify with a lot of college students in the scavenging for food department as well as finding the types of foods we eat and recipes that are easy to make. Bring a large pot of lightly salted water to a boil. Cook elbow macaroni in the boiling water, stirring occasionally, until cooked through but firm to the bite, 8 minutes; drain macaroni and return to pot. Heat a large skillet over medium-high heat. Cook and stir beef in the hot skillet until browned and crumbly, 5 to 7 minutes. 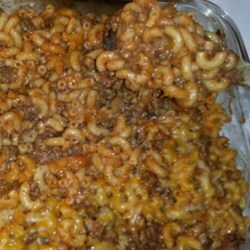 Stir tomato soup and tomato sauce into the beef; pour into pot with macaroni and stir. Transfer macaroni mixture to a 1.5-quart baking dish; top with Cheddar cheese. Bake in preheated oven until the cheese is melted, 10 to 15 minutes. Next Next post: Gabbing with Grunt: What’s this free education you speak of?